At the moment, the bowl of mandarins on our table is always full. Sure, you could buy mandarins all year round, flown in from various parts of the world, but there's nothing quite like the flavour intensity and nutrient-density of freshly harvested mandarins that are just in season in your local area. Waiting for fruit to come in season builds greater appreciation for each fruit, each taste. This Imperial Mandarin is the first fruit tree inside our garden gate - a perfect spot to grab a few ripe ones on the way home, or on our journeys out and about. Besides the Tahitian limes and some lemons, this mandarin is the first of the citrus to come on this season in my garden. We are now closely watching the blood oranges, navel oranges, ruby grapefruits, Buddha's hand (citron), lemonades, and tangellos. The kids absolutely love mandarins (Citrus reticulata) and so do I. The fresh uplifting scent of often-peeled mandarin zest surrounds us at the moment. Mandarins are nutrient-dense, full of vitamins, minerals, fibre and phytonutrients. 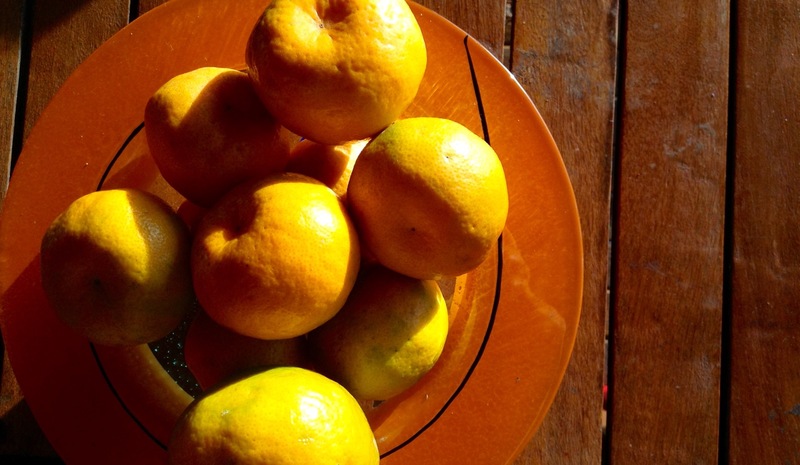 It's so great that mid-winter coincides with peak mandarin season - an delicious fruit packed full of vitamin C for helping to the coughs and colds away. the scent - the flowers have an incredible scent, but so do the ripe fruits. I love the smell when someone is opening a mandarin. It's easy to make a citrus room spray (I need another post for that one). the colour - orange is my favourite colour - a bright happy positive colour - some walls on the main house are mandarin orange. baking - sugar-free mandarin and chocolate cake is delicious. I just toss an entire mandarin into the food processor while mixing up a sugar-free chocolate cake, or make mandarin poppy-seed muffins. Here is my recipe for sugar-free choc-banana cake - just swap over the fruits. There are of course just so many ways to use mandarins - too many ways to describe here. They freshen up breakfast, lunch and dinner. Then there are many ways to preserve mandarin too - bottling, drying, jams and marmalades, sorbets. To keep enjoying homegrown mandarin flavour well after all the fruit is gone, it's a great idea to dry the peels. Because I have grown my own, I know there are no chemical residues on the skin, but if you have bought yours, make sure your peel off any stickers and wash them well before drying. It's possible to lay them out in the sun for a few days, but if you live in a humid climate like me, a dehydrator might can be handy - or an oven turned on very low. You know they are ready when they are crisp. Tea - use by itself or as a blend with other teas or herbs. Melt the cacao butter and coconut oil over a low heat. Just as it melts, add the cacao powder, mandarin peel and stevia and mix well. Pour into moulds - mini cupcake baking cups work well. Put it into the freezer to set. Dried mandarin peel can also be used as: a gentle face scrub (grind dried mandarin, mix with honey, put on face for 5-10 minutes then wash off) even a moth repellent (place dried peel in your cupboard). Mandarins have a short shelf life (2-4 weeks). We cannot eat all the Mandarins on this tree in the next few weeks so most places I go, I find myself taking little handfuls of mandarin gifts to share. I love being able to share my produce like this. 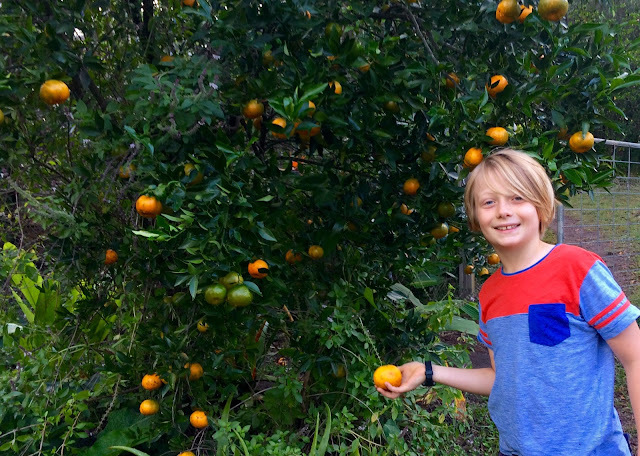 Our abundance - our Imperial Mandarin tree is now covered in fruit. 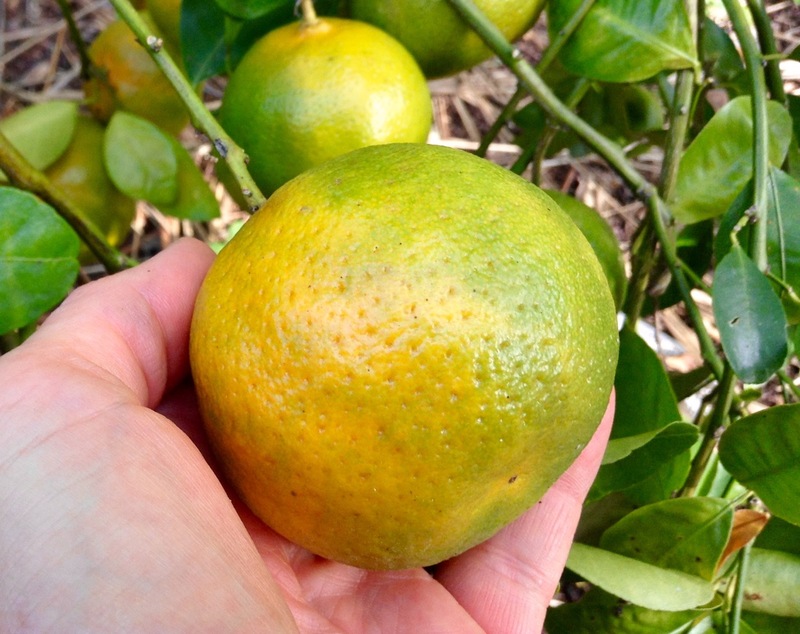 Did you know that the mandarin, citron and pomelo are the ancestors of most of the other citrus? Mandarins are the only sweet ones of these original citrus and therefore really important to the development of all the sweet citrus we have grown to love. Mandarin was originally from Southeast Asia but has ended up around the world. It was highly prized in China and the bright golden glow has long been considered to be an auspicious symbol of good fortune and abundance. Originally mandarins were strictly reserved for royalty. Mandarin is actually named after the deep orange robes traditionally worn by Mandarins - high ranking Chinese officials of the Imperial Court. In 1805 a few mandarin trees were taken to England from China, and eventually they ended up here in Australia where they are now a prized fruit. A few of the Hickson Mandarins are starting to turn and will be mostly ready from June-August. Imperial (May) is the first Mandarin to harvest each year in my garden. This is an old Australian variety from Sydney (circa 1890). It is a small-medium fruit that is easy to peel and has few seeds. We've been eating these for about two weeks already. Hickson (June - August) is the very popular mid-season mandarin. It originated in Queensland in 1941. It has bright orange skin, is easy to peel later in the season when the skin becomes slightly puffy and loose. Emperor (June - August) is an excellent large fruit that is easy to peel and segment and has few seeds. 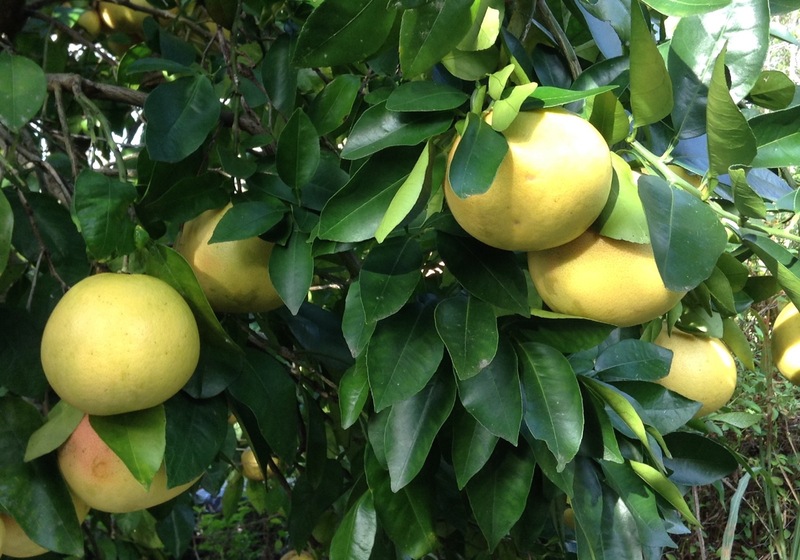 Honey Murcott (August - September) is an attractive medium-large fruit with excellent flavour. It is sweet and great for juicing. Sacred basil to attract bees. Aloe vera which likes the shade and can tolerate dry conditions. Comfrey to feed the plant and provide mulch. Brazilian spinach - which is shade tolerant, drought-hardy and works as a living mulch. When planting, prepare the hole with a good amount of chook manure and water it in well. Place mandarins where they can get at least 5 hours of sunlight. It's often recommended that they have full sun, but I have observed that in these warmer parts, some of my healthiest looking citrus actually get a good deal of shade through the day. 'duo' planting - where you plant two fruit trees in the same hole. This is sometimes preferable to multi-grafted varieties that may end up having one dominant variety take over. grow your mandarin a large pot - preferably a dwarf variety, although being in a pot will ensure it remains dwarf anyway. 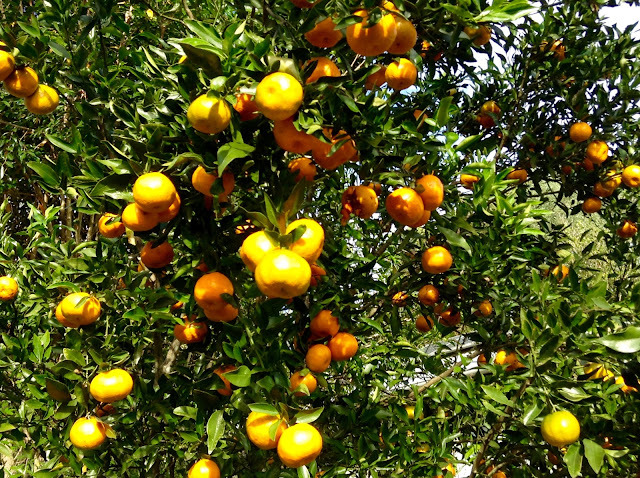 Enjoy the delicious flavours and juiciness of mandarin season! Coming soon in my garden are the abundant ruby grapefruits which are starting to get yellow with red patches.